Taking Your Program to the Next Level | Swing Big! Do you struggle to be as efficient as you want to be in the gym? Are you lacking inspiration when it comes to making assignments? Do you wonder how to take your gym from good the great? This ebook has all of the answers. This guide will give you 27 pages packed with content covering all of the topics you care about most. Learn how to design workout schedules, create manageable assignments, maximize efficiency in the gym and build flexibility and strength programs. This guide will help coaches that are just starting out to think about and plan for significant areas that will affect their programs; it will also help seasoned coaches gain new perspective on ways to take their programs to the next level. 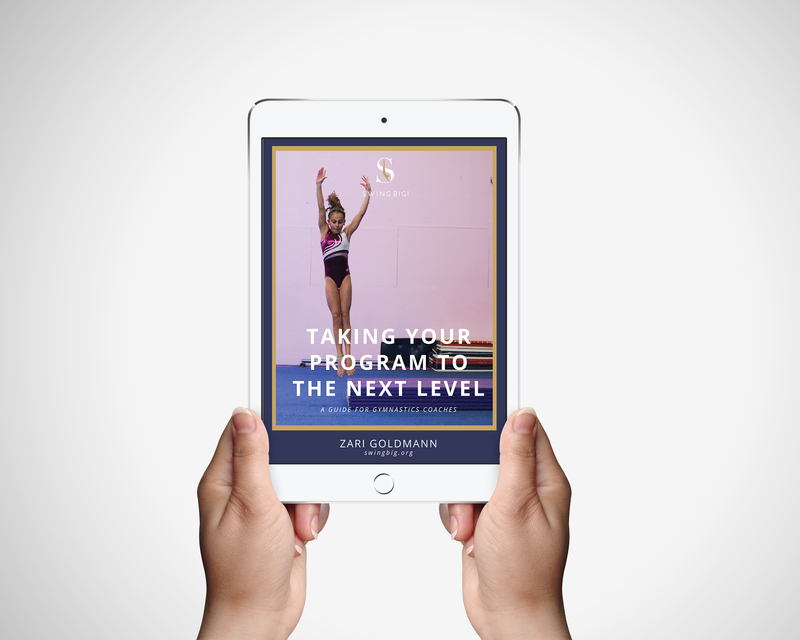 The guide also includes great interviews and sections written by Justin Laury of Splitz Gymnastics, Eddie Umphrey of Twin City Twisters and Mike Durante of Aerial Athletics.